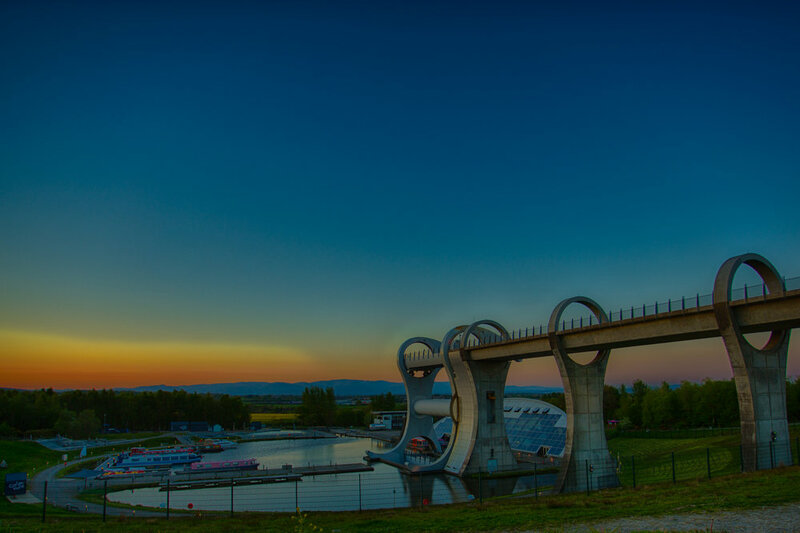 I have several pictures of the Falkirk Wheel through these pages, partly because I live so close to it and partly because I have never got a photograph that I have been really happy with. I spent the magic hour taking shots there this evening, it was a lot colder than I thought it would be and was annoyed with myself when I realised that my down jacket was in my car! I posted these two photographs, the first one a HDR shot from the west side and the second is a silhouette shot from the east side. I like the silhouette shot as the structure cuts between the sunset and the darkness. I am sure that if I had stayed longer I was have been able to get some stars in the photograph, perhaps I'll do that next time. After a particularly challenging day it was good too spend a couple of hours recharging my Chi and watching the sun go down. Taken on the 7th of January, from the bridge that crosses the Forth and Clyde canal (which I think demarcates Bonnybridge from High Bonnybridge). The weather was misty/drizzly and with a little higher ISO setting I think this image came out quite well. I also used a new app called Filmborn which allows you to take images using filters that give the effects of older film types (for those that are still in love with film). This was taken using the ILFORD HPS setting, but some of this was lost in the little post processing that I did.